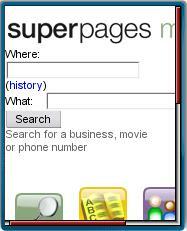 Superpages.com, which was primarily an U.S.only online phone directory has expanded their mobile offering into a full blown local search engine. The site, which is owned by Verizon spinoff Idearc Media now provides business search by name or category, maps, driving directions, WiFi hotspot search, weather forecasts, movie reviews and show times in addition to phone number look up by name and location and a reverse phone number directory. It’s still U.S. only, however. The site gets the job done although it continues Superpage’s tradition of quirky user interfaces. There are “What” and “Where” fields at the top of the page along with a “Search” button. Below that are icons for Maps, WiFi, Directions, etc. The quirkiness is that you have to use the search form at the top of the page to search for something before the other icons will work properly. If you just load the page and go straight to “Maps” or some of the other icons you’ll get a cryptic “No further information was provided” message, presumably because your location hasn’t been set. In this case Superpages should prompt you for your location but doesn’t. Once you get past the issue with setting a location there are some nice touches to Superpages Mobile. Phone numbers in results are click to call and there is an “Add to my contacts” link that uses the WAP wtai://wp/ap;number;name URI construct to add the listing to your phone’s contacts. This works on most Nokias and BlackBerries, I’m not sure about other phone brands. If you register, which can be done on the Superpages mobile site, you can save your favorite businesses, people, locations and reviews in “My Superpages”. This entry was posted in LBS and tagged hotspot search, local search, mobile site review, movies, phonenumber lookup by Dennis Bournique. Bookmark the permalink.